I love soup. Soup is supposed to be HOT, not cold, except for Vichyssoise or Gazpacho. 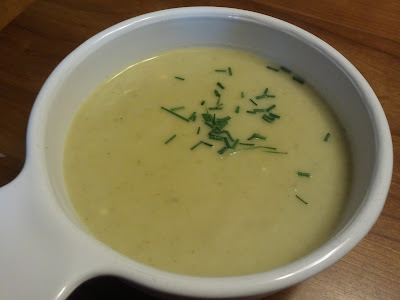 I don’t like Gazpacho, but I do like Vichyssoise and I think you might like it too. Try it. If you don’t like it cold, you can always eat this soup hot, it’s good both ways. This is the combination of an Alton Brown recipe, with the addition of the Boursin that comes from Emeril. To clean leeks, slice them open vertically. Fill the sink with cool water and allow the leeks to soak in the water. Separate the leaves and scrub the sand out of layers. Drain the water and allow the water to run over the leeks, and then dry with a clean dishcloth. This soup can also be served cold. Vichyssoise IS normally served cold, but this soup is very good hot. I have made this with half and half instead of the heavy cream and buttermilk. If you do, add 1 T. of fresh lemon juice to 2 C. of half and half, to mimic the buttermilk. Buttermilk is tart and the lemon juice does the trick.